Rescue – The process of finding a wild animal sick, injured or orphaned, in need of a responsible human to help protect its survival. 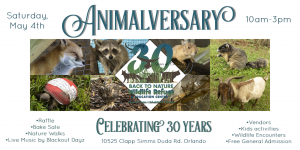 The main goal of Back To Nature’s Animal Rescue is to provide the proper medical care and treatment needed for injured and orphaned FL native wildlife. With the help of local officials and private citizens, Back To Nature helps rescue thousands of animals yearly. 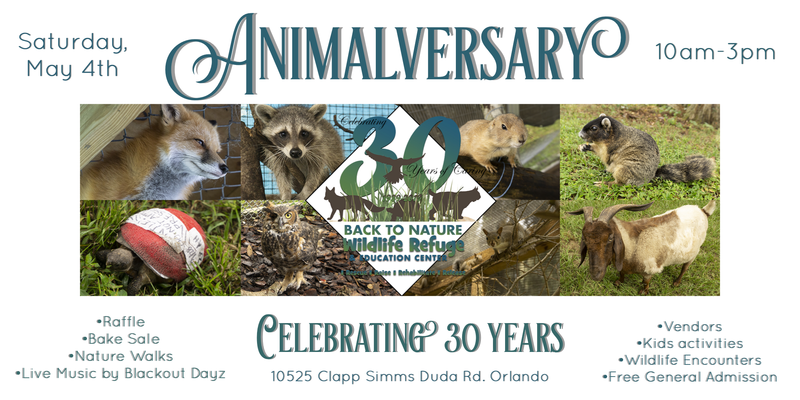 Back To Nature is dedicated to the rescue of injured and orphaned Florida Native Wildlife. 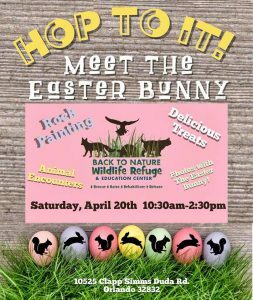 By working with the local Orange County community and Animal Services, Back to Nature rescues approx. 2,500-3,000 animals per year. Our passionate staff and volunteers work around the clock to make sure that every rescue animal is given the proper care and love. Back to Nature has rescued thousands of animals. In some cases though, special attention is required. These special cases include non-Florida native species or wildlife that may not be able to survive if released back into the wild. Upon approval by the Veterinarian of Record and FWC or USFWC some of these animals become permanent residents of BTN. Our facility currently houses 30 non-releasable animals at our wildlife refuge. There are 19 different species which consist of both exotic and native species. Each animal has a special story and a special reason for why they live at Back to Nature. Click here to view our Residents Page. Upon arrival of every animal brought in by a private citizen, each animal is given a full examination to best determine its treatment. Rabies Vector species are evaluated by staff only and extra precautions are always taken. This ensures that no harm will fall upon the other resident wildlife or wildlife currently being treated at our facility. We ask that all citizens take extra precaution when transporting injured or orphaned wildlife. Support BTN by contributing donations towards our cause. 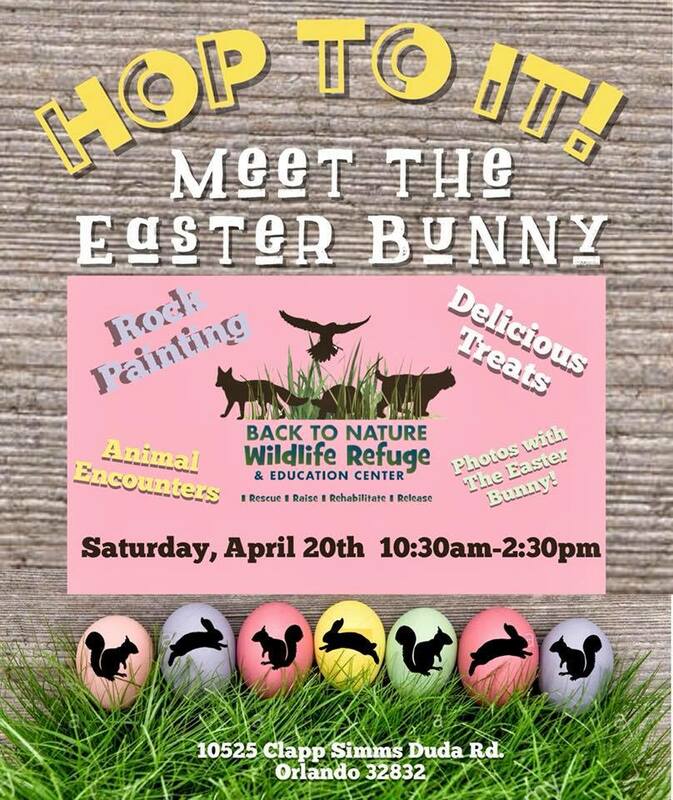 If you have found and animal and want to know how you can help, please refer to the information below to find out what measures you can take to help save the wildlife before bringing them to Back To Nature Wildlife Refuge. BABY SONGBIRDS – What many people don’t realize is that most of the baby birds they find on the ground are supposed to be there. If you find a featherless, downy, or incompletely feathered bird it will need your help. If the bird appears uninjured the best chance of survival is if it is returned to the nest. So if possible, gently return it to the nest. If you find a nest on the ground with babies or eggs, tie it back to a nearby tree. The nest can be placed in a little box or margarine tub (with drainage holes) to make it easier to secure. If the baby appears injured or the nest cannot be located, place the bird in a small, covered box lined with tissue; keep it warm, dark and quiet. If all goes well, nestlings grow up and become fledglings, which have stumpy tails and are fully feathered – but cannot yet fly. If you find a fledgling hopping on the ground, don’t pick it up. This period of being on the ground is a normal and necessary part of a bird developing the skills of survival. The parents are still around, feeding them, showing them where to look for food, and hiding them under bushes. The best thing you can do is keep your dogs, cats and children away from the area for a few days. If you’ve already picked up the bird, place it back where you found it or under a nearby bush. Of course, there are times when the fledgling does need help, such as when it’s injured or in the middle of a busy street. In that case, place the bird in a small, covered box or paper bag to keep it warm, dark and quiet, and bring it to us. Minimum contact reduces stress and increases any animal’s chances of survival. Adult song birds can die from stress very quickly if not given a safe, dark, quiet place also. DO NOT OFFER FOOD. Provide a few drops of water or Pedialyte during the first 12 hours. VET offices, in most cases, are not licensed to accept or examine wildlife. All injured and orphaned wildlife must be taken to a licensed wildlife rehabilitator/facility. TURTLES AND GOPHER TORTOISES– Both turtles and tortoises are never considered ‘orphaned’ because they hatch alone and are able to forage on their own. If you find one, leave it alone. We are not allowed to legally accept any turtle or tortoise unless it has been injured. Gopher tortoises are a threatened species and can only be handled if injured and must immediately be transported to a licensed wildlife rehabilitator or animal services officer. WATERBIRDS – The young of ducks, geese and many shorebirds are born with their eyes open and are able to immediately forage on their own. Ducks and geese will often leave their young for several hours; do not pick them up thinking they are abandoned – most times they are not. Obviously, there are situations when these babies are in distress and need to be rescued and you will need to evaluate the situation you find them in. SQUIRRELS – If you find a young squirrel on the ground that appears healthy and the nest has been destroyed, the squirrel can still be returned to its mother. Squirrels use two or more nests concurrently throughout the year. Follow the steps below and allow the young squirrel a second chance at being raised in the wild by its mother. Just like young birds, young squirrels frequently fall out of their nest and do not always need to be rescued. It is always in the best interest of the squirrel to be raised by its parents. If you find a young squirrel on the ground that appears healthy, place the squirrel in a small box with low sides in the location where you found the squirrel. Put a warm blanket or a hot water bottle in the box to keep the squirrel warm. The mother will not take back a cold baby. Keep all domestic cats and dogs away from the area. Leave the box and observe from a hidden area for 3-4 hours. The mother will not approach if she feels threatened in any way. If after 3-4 hours the mother has not come to collect her young, the squirrel may need to be rescued. If you find a young squirrel on the ground and there are signs of blood, broken bones, or it has been attacked by a domestic cat or dog, place the squirrel in a covered box or carrier with a towel. Keep it in a warm, dark and quiet place and bring it to us as soon as possible. DO NOT OFFER FOOD OR WATER. RACCOONS are the highest RABIES carriers in Florida. Do not handle unless absolutely necessary (and wearing gloves). Keep away from children and pregnant women. They may need to be fed every 2-4 hours by use of a dropper or small infant bottle. OPOSSUMS, COTTONTAIL and MARSH HARE, and SQUIRRELS can die quickly from aspiration pneumonia. Keep them warm and only use a pedialyte filled dropper. Depending on their age, they will need fed atleast 1/2-1 dropper full of pedialyte every 2-4 hours.